Reviews | Regal Fine Black Pepper - 8 oz. Regal Fine Black Pepper - 8 oz. There's no doubt that black pepper is an indispensable addition to any pantry. Stock up and save costs with this economical 5 lb. supply of Regal fine grind black pepper! 100% pure and ground from premium peppercorns, this fine grind black pepper is great for cooking. It has been fine ground, meaning that it has a dust-like consistency with a mesh size of 50, and is smaller in size than a fine salt. Fine grind black pepper is best used for salad dressings, purees, egg dishes, potato salads, and foods in which larger, darker pepper flakes should not be noticeable. You get a lot for your price. We filled about 10 pepper shakers and had plenty left. When using this pepper be aware that it is finely ground so it is a litter harder to see when seasoning your food. Should of read the description was aiming for the fine pepper and this pepper was extra fine. The price is definitely fair so if your looking for this grade of pepper order from here.. Fantastic product. Large quantity at a great price. We use to use another company for spices but have switched to Regal because of the extremely competitive pricing and the availability of bulk quantity. I would HIGHLY recommend all restaurants switch to Regal products!! Black pepper, a staple in most dishes, is a must-have for all kitchens. This fine grind is perfect for all of our recipes, and is an exceptional value. Excellent flavor! Great product. This is super ground pepper. The price was good amd it was perfect to fill pepper shaker with as well as cook with. The Regal Fine Black Pepper worked great for my pepper shakers however it is very fine and you need to be careful when using as you may end up with more on your plate than you bargained for. Nice pepper, very sharp peppery flavor and aroma. And they are not kidding, it is very fine! For my own use, I like something a little coarser. But I can't complain because they advertised it just right. We purchased this by accident this is a very fine black pepper not for pepper shakers not for use in the salt and pepper mix in the kitchen. I would assume this is Used in baking and some sauces. This pepper is very fine and powdery. It would be great in a pepper shaker with small holes. I think a coarser pepper would be better for cooking. I love Black pepper and the fine ground black pepper from Regal spice is more of a powder which I wouldn’t particularly use in some dishes but its great for Bbq rubs and spice blends. You just really have to be careful with how much you add since it is so fine you can easily add too much pepper. Great value, it's very difficult to find flavorful fine ground black pepper and you simply cannot beat the price. I will definitely be ordering this again. The regal fine black pepper is very fine! It is notgood for table shakers but great for cooking needs. It has a little bit of an earthy after taste then some peppers but I think it is good. a very fine grind , perfect for the table or cooking of any kind and the flavor is exceptional..the price is very reasonable as well. This fine black pepper comes in an 8 oz. bottle, it’s great for a refill on a smaller pepper shaker and it’s a great price! 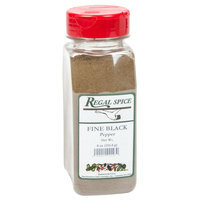 Regal fine black pepper is excellent to add spice to any dish. Black pepper comes in a variety of textures. The fine-grained spice has a medium with a zesty flavor. Didn't really like. Its to fine even to cook with. Or just use a little or very little. It seems to be stronger than table pepper. We appreciate your review, Christine! We are sorry this black pepper did not meet your expectations. If you are looking for a different product that would better suit your operation, please contact our Customer Solutions team. We used this Regal fine black pepper for almost every food we cook. This bottle has 8 ounces of black pepper goodness to season every food to your heart's content. The Regal Fine Black Pepper - 8 oz. is a great buy, the Regal brand is long trusted around here, and you get SO MUCH for so little without losing any quality, that's awesome! I didn't realize when it says 'fine' pepper, they really do mean FINE. As in, it's more of a powder than what you would normally find at the grocery store. As such, I wouldn't recommend it for seasoning dishes by hand, but it would be good for adding to spice mixes. I didn't take any stars off for the fineness of the grind, that was my misunderstanding, but I did take stars off because the flavor and pungency of this pepper doesn't seem that strong. Can't beat the price! black pepper in the store is crazy high priced. and sometimes the quality is off. this was great! great quality and price. Will NOT buy black pepper in the store again. I love this fine black pepper for seasoning on everything that I cook. It has the best taste. This particular size fits great on my table for garnishing. While this pepper is listed as "fine" I would lean more toward "very fine" ground pepper. That said, it is pepper- it does just what you would expect, but a little more fine than the picture represents. As with all Regal spices, this is a fantastic value and a great tasting product. Be warned, this grind is so fine it has the consistency of powder. You will not be able to use it in a shaker and even using the shaker built into the container is dicey as it flows out very quickly. If you are looking for a fine pepper for sauces and soups that will flavor without leaving large, visible grinds, this is for you. I never expected this fine grind to be like dust/powder. It's not for use in pepper shakers that's for sure. I'm just glad I purchased the 8 oz size to see what it was like. It would be nice if the "table" pepper came in a smaller size other than 25lb so a person could sample it as well. I wouldn't want to make a mistake purchasing 25 lb of something that's also not usable. Thank you for your feedback, John! We are sorry you did not prefer this product, we do have the Regal Table Black Pepper in a 5 lb. option which might suit your needs a little better! Bought this as a seasoning for a dinner I catered his past weekend. The fine cut works in the shakers I also bought on this site formgeill side seasoning. Black pepper in general is a house hold staple item. We could have easily ran out to the store to purchase more, however, we have had an extreme amount of good luck with Regal spice we decided to wait on this one to arrive. We are glad we did because the price of this one was cheaper than buying a 3oz. canister at the market; Tremendous buy. Although the pepper might be "fine", the product quality is better than "fine", it is great! Easy to shake out or take out with a measuring spoon, and delicious on my food, I was very glad to have this by my side at every meal. Great product my wife is in love with the regal fine ground pepper I enjoy something a little more coarse but this product is still good. I use this for everyday use in rubs and flavoring soups, vegetables, etc. it's very useful for dispersing the flavor evenly throughout a dish because of how fine it is. This is a very good value. Be aware the grind is very fine. I have an old fashion barbeque sauce recipe that calls for lots of black pepper. Very satisfied. This product has lasted many months. It is ground finer than the pepper I generally use to cook with so a little went a long way. I only use this pepper for my eggs benedict and it has never let me down!! The smooth consistency does not need any additional grinding like I have experienced with the competition!! Very nice great quality pepper. Ultra fine means it breaks down super easily in food and you wont be biting down on chunks of pepper in your dishes! this is great black pepper, it tastes wonderful and is so fresh, i use it on many things, makes it easy to measure it, great stuff! regal black pepper is always so tasty. This fine is close to powder like and adds very little texture to your food, so it works great inside soups and sauces. Good price for fine black pepper - good for refilling your pepper shakers on your table or keeping by your oven and stove for seasoning meats or broths. This pepper delivers great flavor at a great price you will be satisfied at the quality of this product,im a happy customer and you will be too. Regal's fine black pepper is a good uniform grind small enough to go through a table shaker. The grind is also fine enough it doesn't settle out of sauces and the cost is reasonable enough to use it in large quantities in rubs and grill sauces. I usually go for the slightly more coarse stuff but this is just as good. Great for seasoning foods that you don't want chunks of pepper floating around in- When they say fine they mean it! Black pepper is so expensive and the price and quality here cannot be beat. I love ground black pepper more than the grains I can see and feel so thus purchase for me was a must. I absolutely love this product! You can't go wrong with black pepper. I don't normally use fine but I tried it and it really gives a nice flavor without the pepper seeds getting stuck in your teeth! We like serving Regal fine black pepper. The quality and price is right. We purchased it from the Webstaurant store. The delivery was on time too. 4 stars! This is a super fine pepper, so if you are needing texture I would not recommend. However, it does have a nice flavor over gravy. This is good pepper. It is as good as any other brand. There isn not much different in one black pepper to another, I guess. Sir Clean recommended Regal Fine Black Pepper - 8 oz, you can use to season different food, the quality is really good and we like the designed. Regal makes great spices so you know when you order this black pepper it will be great,and sense its from webstaurant it will be priced low. This is the finest, most Regal black pepper that I have ever used. Really... it is ground finer than anything I have ever seen. Nice though. Nothing has come close to the quality and price we get with the Regal Fine Black Pepper. It really can not be beat as we have tried to challenge both several times and keep just coming back. This Fine Black Pepper is very powdery and works extremely well for adding to marinades or anything elsewhere you would want it to mix in quickly. When ordering this, I didn't realize how finely ground this would be. I thought it might be consistent with normal store-sold fine ground pepper, but this almost too fine - powdery and flour like. Makes it a bit difficult to use and is easy to overdo. Regal Fine Black Pepper is a great pepper for table usage. I refill shakers with this all the time. It is fine enough to flow out of all shakers. I like the Regal coarse ground pepper for cooking. If you have a need to fill lots of shakers try the bulk spices. I find the black pepper from webstaurant to be on the milder side. We always use it as part of a blend so it works well for our needs. Really enjoy the company and the spices they provide. The black pepper is perfect for our use in mixing it with other spices to make a rub. A great value for 16oz! I am using this to fill little salt and pepper shakers for a wedding. I love that it is fresh and ground down fine! wonderful aroma delicious flavor amazingly convenient. This pepper is great for recipes. It is too fine for shakers but for adding to recipes it is just wonderful. We were surprised at the rich taste as sometimes you lose flavor when it is ground so much and not as fresh. This is very fresh and a great spice! This is a good size and the peppers are ground very finely, it's almost like pepper dust. It has good flavor and great for any kitchen. I just love the spices that this site carries, everything is fresh and the value on par with what you're buying. Good quantity and amount. Very fine ground pepper. Pepper is expensive and this is a great buy. Nothing beats fresh ground, but this is very fresh and a good, quick substitute. This is a very fine black pepper. I use it in soups, stews, on eggs, vegetables and salads. The taste is not as intense as ground pepper so it gives an all-over flavor instead of more defined flavors of larger pieces of peppercorns. Some people don't like a large grind because of the intensified flavor when they bite into a larger piece. We have more than one kind for every taste. When the label says "Fine" black pepper, they really mean it! It smells and tastes like the finely ground black pepper that I'm used to, but it literally is the consistency of dust. I am sure this is my fault--after all, the label is very clear about the fact that the pepper is finely ground--however, I am not sure I will use this as much as I'd hoped. I use black pepper daily and this is by far the best I have found yet. It is so fine that one might accidentally pour too much and have a sneezing fit. But no worries I use this at home and my restaurant for spice blends of my own. Great product when a receipe calls for fine black pepper. Price is great ordered 2 for pepper special fine shaker. What ever type of pepper you need Web has it here. This fine black pepper is delicate for seasoning your eggs, soup and anything where you want it to blend in smoothly and disguised for exceptional flavor. Regal makes some of the best herbs and spices, we use these on a daily basis and have been very pleased. You'll be hard pressed to find a better product for the price. Ooo this stuff is good! My husband is a pepper lover! We go through this stuff like crazy!!! Will definitely be buying this product for years to come. When I first opened this container, the pepper tasted very fresh (and still does). It is indeed finely ground, which is great for cooking. I would recommend a less fine grind for pepper shakers. The size is perfect for our large family that cooks a lot. We use fine black pepper from time to time in gravy and in some of our rubs. The price could not be beat and it was just as fresh and flavorful as the more expensive brands locally available. This Fine Black Pepper is just what I was hoping. I don't like chunks of pepper, however I do like a pepper taste. This fills the bill perfectly. A nice pepper taste without the pepper between my teeth. My kids don't notice it either because they don't notice the chunks in their food. The flavor is subtle, however it definitely makes itself known in a very rich way... I don't think I could ever go back to the traditional style of pepper. Simply Great!!! It's pepper, like what cant you add this to lol. In love with how fine the grain is. The aroma is intoxicating and a must on the daily. I love how fine this pepper is. It's like dust. So when adding it to a recipe it blends well and you don't have huge black specks like some other pepper. Very flavorful. I have been using this in everything since it arrived. The best value on Fine Ground black pepper in the 8 ounce size that we could find. We add pepper to everything and this fine ground incorporates into dishes perfectly. The regal line of spices are a great value. You get a great amount of fresh, fragrant product for the price. Fine pepper is great for including in dishes where you don't want to see coarse chunks of pepper or have too much bite to someting. This is a great price for the bottle of black pepper, which will last me a long time. I love the fine grind because it gets integrated better into dishes. A really great product that is price just right, we use on a daily basis and this jar is very easy to handle, buy a couple bottles. This is the first time I have used a fine ground black pepper and I was amazed. It adds a subtle amount of heat based on your preference. These are top quality spices that can compare to any top brand. They are not second rate spices. The price is a steal. Plastic containers are not thin and lid fits securely. This pepper is a bit fine for our shakers, but we will order something different next time. Delivery time was excellent and we are very happy with the depth of product offerings at www.websaurantstore.com. Great price for black pepper, no more over priced spices from the store for this guy. Thanks WEBstaurant! Very fine and good quality. 8oz fills 1/2 a small container. We are very happy with this item. It was a great deal! We will reorder again. The product arrived quicker than we thought. Very glad that we found this website. The grind black pepper is cheap comparing it to other stores. The taste is great. Will continued to buy all my seasons from your website. Very nice container and the taste is excellent. You can't beat the price here as compared to what you get at your local grocery stores. Recommend very highly. This regal fine ground black pepper is extremely flavorful for a pre ground black pepper. I was certainly surprised at its potency. Definitely an economical purchase. This is certainly "fine" ground pepper. Works great in all sorts of recipes, and you wouldn't be able to tell from the taste that it saved a lot of money. Highly recommend.